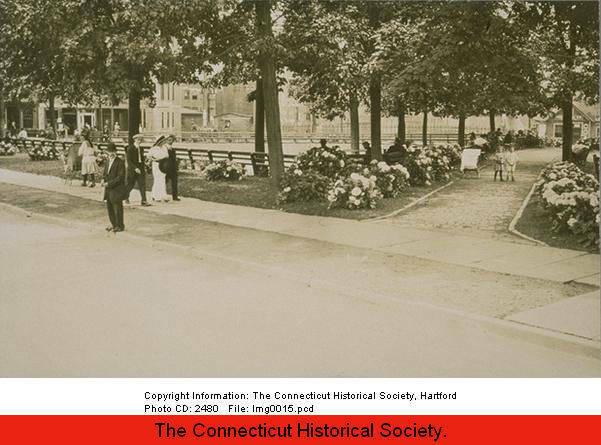 Many of the great programs offered today by one of our sister institutions, the Hartford Public Library, are rooted in the work of Caroline M. Hewins. 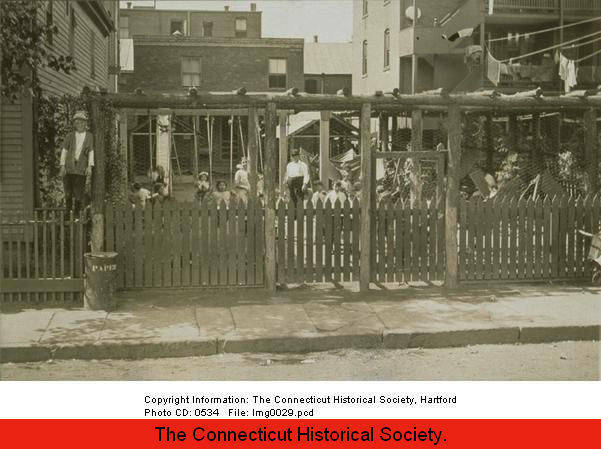 During her 50-year tenure as librarian at the Hartford Public Library, Hewins ran many programs for Hartford children, including the City History Club. In 1910, at least two of the participants, Rebecca Miesel* and Anna Goldberg**, kept journals of their experience. Rebecca Miesel lived with her mother at 21 North Street. She was 13 when she inscribed her name and address inside her notebook. She also noted participating in the Out Door School at the city’s Goodwin Park. Anna Goldberg lived close by at 22 Village Street. Twelve years old, Anna was in Room 26, Grade 7, at the Brown School. According to the 1910 Census, Anna lived with her grandfather, parents, an uncle, and six siblings. Neither North Street nor Village street remains today, having become victims of redevelopment. 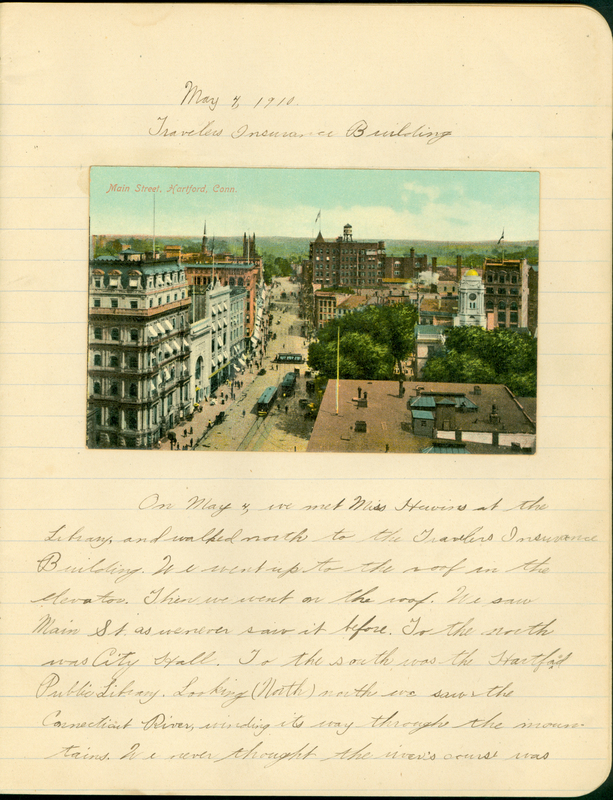 In identical composition books, Rebecca and Anna described visits to the Travelers Insurance building, Colt’s Park, a bridge dedication, the Capitol, and other local monuments. Anna wrote more entries than Rebecca, seemed to have a better command of English, and went into more detail in her descriptions. Miss Hewins was dedicated to enriching the lives of the city’s underprivileged children. Even remaining in their own backyards, she was able to show them more of the world than they may have previously seen. 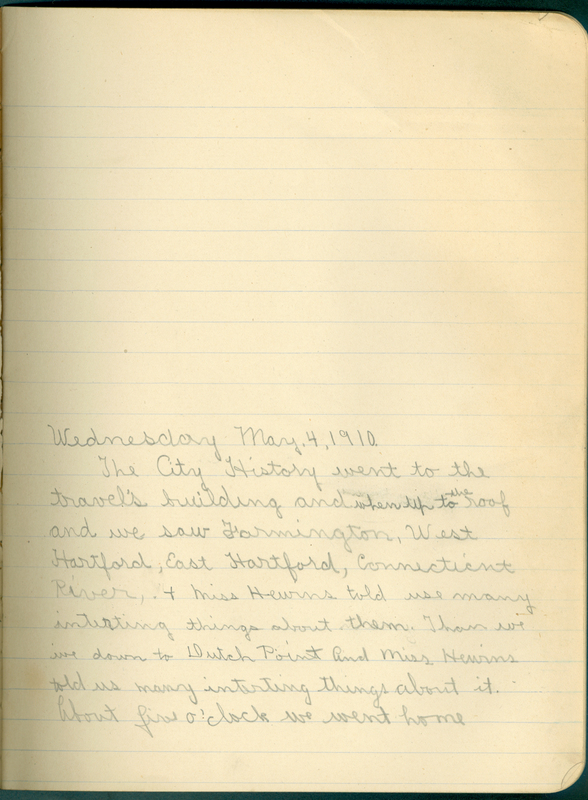 As an archivist, I’m thrilled Hewins had the students record their experiences, and that the notebooks have survived. This is also an experience that could be repeated today. Though so much of the world has changed in the past century, seeing our cities and towns from above still fascinates many of us. Whether from the Travelers Tower, a hike up Talcott Mountain to the Heublein Tower, or the roof of a friend’s apartment building, I hope every Hartford student will have a similar adventure.